When do honey bee guards reject their former nestmates after swarming? Honey bees (Apis mellifera L.) reproduce by swarming wherein the mother queen leaves the nest with approximately two thirds of her workers (the prime swarm). Several daughter queens are raised in the original nest, and these start to emerge shortly after the first swarm departs. One or several of these daughter queens may then leave the original colony sequentially with smaller afterswarms. 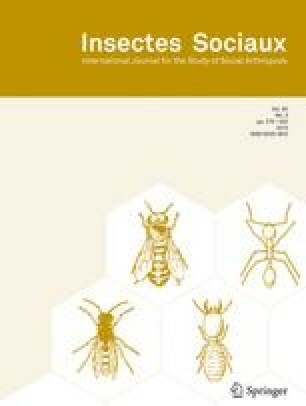 Here we study the change in acceptance of former nestmates after colony reproduction using free-flying honey bee colonies. We used a total of four colonies each of which we divided to make four new colonies: two artificial swarms (the offspring colonies) and two colonies that mimic established ('old') colonies after swarming. The way the original (mother) colonies were divided allowed us to determine the relative importance of wax comb on cue divergence. Half of the divisions contained the original wax combs from the mother colony whereas the other divisions were not provided with comb requiring them to construct their own. We then tested the acceptance of former nestmates by introducing foragers at the hive entrances and observing the behaviour of guard bees. Our results did not show a consistent change in acceptance of former nestmates after swarming. In two out of four replicates, workers originating from the colonies that contained the original wax combs were rejected by guards from the initially comb-less colonies. This suggests that comb wax plays an important role in nestmate recognition. However, the remaining two replicates did not show a response; all former nesmates were still accepted two weeks after artificial swarming. Key words: Honey bees, Apis mellifera, swarming, nestmate recognition. Received 25 April 2001; revised 3 August 2001; accepted 29 October 2001.